Dreamcatchers roughly based on native designs are popular throughout North and South America. A dreamcatcher is a sacred Native American object that consists of a ring of red willow, or other similarly common and pliable bark, held together by a web of sinew or fiber, connecting to the ring in seven or eight places. At the base of the dreamcatcher, there are several feathers. Although the origin of the dreamcatcher is unclear, due to the damage done to Native American culture by European colonizers, it is theorized that they originated among the Ojibwe tribe of Native Americans, but as disparate groups of Native American tribes came together in the 1960s and 1970s (known as the Pan-Indian Movement), the tradition spread. Dreamcatchers are used to encourage good dreams. Ojibwe and Lakota lore depicts them as either trapping good or bad dreams, but the feathers almost always direct the good dreams to the sleeping owner of the dreamcatcher. The Native Americans believed strongly in the spiritual realm, as well as in the power of dreams—things modern scholars are still baffled by and investigating. The origins of the dreamcatcher are quite unclear, mostly due to the loss of much Native American history during European contact, colonization, and forced relocations. It should come as no surprise that the persecution of the Native Americans had such a detrimental impact on their history. Yet, legends surrounding the dreamcatcher exist in nearly all tribes across North America, and most of those legends revolve around similar themes: Spirits, spiders, and most prominently, dreams. The first documented observation of the dreamcatcher was in 1929, among the Ojibwe (known then as the Chippewa), by ethnographer Frances Densmore. Many believe that dreamcatchers indeed originated in the Ojibwa Nation, and that during the pan-Indian movement of the 1960s and 1970s, they were adopted by Native Americans of a number of different Nations in an effort to show solidarity. They came to be seen by some as a symbol of unity among the various Indian Nations, and as a general symbol of identification with Native American or First Nations cultures. However, some Native Americans have come to see them as "tacky" and over-commercialized due to their acceptance in popular culture. Traditionally, the Ojibwa construct dreamcatchers by tying sinew strands in a web around a small round or tear-shaped frame of willow (in a way roughly similar to their method for making snowshoe webbing). In fact, red willow, common in many parts of the United States, was originally used, along with red twig dogwood and other members of the willow family. Feathers are then connected to the finished product, connected either by further sinew or, as was also common, stalk of the stinging nettle. These dreamcatchers were often made by grandmothers or grandfathers of newborn infants and hung above their cradle boards. In Ojibwe tradition, the night air is filled with dreams—good and bad—and newborns are unable to defend against the bad ones. Thus, because bad dreams are both confused and confusing, they get caught in the "web" of the dreamcatcher. Trapped, the bad dreams are then evaporated by the morning sun, as happens with dew on grass. Good dreams, however, are peaceful and make their way through the web, down the feathers, and to the child. The slightest movement of the feathers indicates pleasant dreams. Dreamcatchers, constructed from organic materials, are not meant to last forever; instead, they are designed to disintegrate over time, as the child grows into an adult. A dreamcatcher. The good dreams find their way to the center, down the feathers, and to the sleeping person it protects. According to Ojibwe legend, long ago, Asibikaashi (Spider Woman) brought the sun back to the sky each day. However, as the Ojibwe Nation spread to the ends of the earth, her task became more laborious and Spider Woman began to find it difficult to make the trek for all of her people. Rather, she directed mothers, sisters, and grandmothers to weave magical webs for new babies using hoops made from willow twigs. Called dreamcatchers, they would allow only pleasant dreams to enter the babies' minds as they slept. The circle of the hoops represented the sun. The web's connection with the hoops in eight places represented the eight legs of Spider Woman. When the web only connects in seven places, this represents the Seven Prophecies (a prophecy marking the seven epochs of Turtle Island—or North America). Feathers in the center of the dreamcatcher represented spirit (breath) and life. Adults kept a feather in their possession rather than on their dreamcatcher. 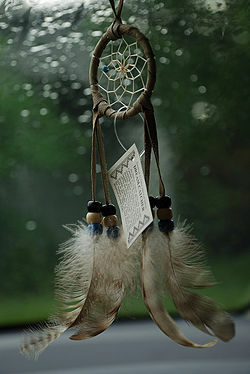 The Ojibwa believe that a dreamcatcher filters a person's dreams. Bad dreams are caught in the web, to be burned away by the morning sun, while good dreams are guided through a small hole in the center, and then to the feathers and into the sleeper's head. The Lakota tell of the tribe elder who long, long ago had a vision on a mountaintop. Iktomi, the great teacher, appeared to him in the form of a spider and spoke to him. As he spoke, he spun a web on a hoop of feathers, horse hairs, and beads. Iktomi spoke of the cycles of life and how human choices could affect the harmony of nature. He gave the elder the hoop and pointed out how the web was a perfect circle with a hole in its center. He explained how belief in the Great Spirit would allow the hoop to catch good dreams, letting the bad dreams go through the hole in the center of the hoop. Iktomi told how the web would help his people make good use of their ideas and visions. Another tale, by an unknown author, explained that a Shaman, who had been very ill, was plagued with bad dreams visions. In an effort to get well, he slept with a Medicine Wheel, but one night a spider found its way down to the wheel and began to spin a web. After a very short time, the web covered the wheel, except for a small hole in the wheel's center. As if it had been intended, an owl soared above in the dark of night, shedding a feather, which floated down, becoming caught in the web, where it hung from the center hole. The following morning, the Shaman awoke as the sun rose, from a peaceful sleep that had been free of bad dreams. In addition, his illness was gone. He felt that his medicine wheel must be the explanation, but he was astonished to see the web and feather hanging from the hole. Thus, the dream catcher was born. The Lakota dreamcatcher works in a slightly different manner than the Ojibwe dreamcatcher. The Lakota believe that good dreams are caught by the web, almost as if they were picked out of the air, and then are carried with the dreamcatcher's owner for the rest of his or her days. Bad dreams, however, pass through the hole in the center as completely harmless. The dreamcatcher also only worked if the user believed in the Great Spirit. They believe the dreamcatcher holds the destiny of their future. A more commercial, popular style of dreamcatcher. 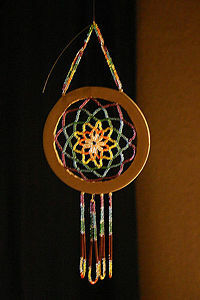 In the course of becoming popular outside of the Ojibwa Nation, and then outside of the pan-Indian communities, "dreamcatchers" are now made, exhibited, and sold by some New age groups and individuals. According to Philip Jenkins, this is considered by most traditional Native peoples and their supporters to be an undesirable form of cultural appropriation. The official portrait of Ralph Klein, former Premier of the Canadian province of Alberta and whose wife Colleen Klein is Metis (one of Canada's aboriginal peoples), incorporates a dreamcatcher. Ojibway dreamcatchers started to become popular in other Native American tribes during the pan-Native American movement of the 1960s and 1970s, even becoming popular in such disparate places as those of the Cherokee, Lakota, and Navajo. Thus dreamcatchers aren't traditional in most Indian cultures, per se, but rather are a kind of neo-traditional. Today they are popularly found hanging in many places other than a child's cradle board or nursery, such as in living room or on a car's rear view mirror. Some Native Americans think of dream-catchers as a sweet, harmless, and loving little tradition, others consider them a symbol of native unity, and still others think of them as a tacky, simplistic, thoughtless perversion of something sacred. Dreamcatchers were also featured prominently in the Stephen King novel and film adaptation, Dreamcatcher. ↑ 1.0 1.1 1.2 Diana Blake, Legends of the Native American Dreamcatcher, Art History, Bella Online: The Voice of Women. Retrieved July 20, 2008. 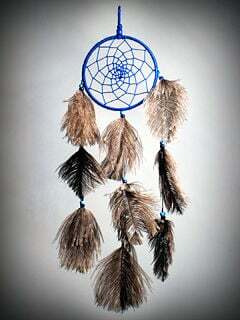 ↑ 2.0 2.1 2.2 Native Languages, Dream Catchers, Native Languages of the Americas website. Retrieved July 20, 2008. ↑ 3.0 3.1 3.2 Dream-Catchers.org, What is a Dream Catcher?, Understanding the Dreamcatcher Legend, Retrieved July 20, 2008. ↑ 4.0 4.1 4.2 4.3 A collection of Dreamcatcher Lore, Dreamcatcher Legends. Retrieved July 20, 2008. ↑ Canadian Broadcasting Corporation, Ralph Klein breaks tradition in legislature portrait, CBC News, August 30, 2007, Retrieved July 20, 2008. Jenkins, Philip. Dream Catchers: How Mainstream America Discovered Native Spirituality. New York: Oxford University Press, 2004. ISBN 9780195189100. Cooney, Linda, and Judith Mitchell. Dreamcatcher magic. Tempe, Ariz: Leisure Time Pub., 1994. OCLC: 33268978. This page was last modified on 10 October 2017, at 16:01.